Even before the new territory is born, 71 people, including 11 Inuit women and seven non-Inuit men, run for 19 seats in Nunavut’s new legislative assembly. Nunavut’s first territorial election, run by the elections authority of the Northwest Territories, attracts an 88 per cent voter turnout. The highly respected Goo Arlooktoo, a former deputy premier of the Northwest Territories, suffers an upset defeat in South Baffin and the former N.W.T. cabinet minister Manitok Thompson is the only woman to gain a seat. ᓄᑖᖅ ᑎᐅᕆᑑᕆ ᐱᒋᐊᓚᐅᕐᑎᓐᓇᒍ, 71 ᐃᓄᐃᑦ, ᐃᓚᖃᖅᖢᑎᒃ 11-ᓂ ᐃᓄᖕᓂ ᐊᕐᓇᓂᒃ ᐊᒻᒪ 7-ᓂ ᐃᓅᙱᑦᑐᓂᒃ ᐊᖑᑎᓂᒃ, ᓂᕈᐊᒐᒃᓴᙳᖅᐳᑦ ᓄᑖᒧᑦ ᒪᓕᒐᓕᕆᔨᒃᓴᐅᓂᕐᒧᑦ ᓄᓇᕗᒥᑦ. ᓄᓇᕗᒥᑦ ᓯᕗᓪᓕᖅᐹᖅ ᓂᕈᐊᕐᓇᖅ ᒐᕙᒪᐅᓂᐊᕐᑐᓄᑦ, ᐊᐅᓚᑕᐅᓪᓗᓂ ᓂᕈᐊᖅᑐᓕᕆᔨᓄᑦ ᓄᓇᑦᓯᐊᕐᒥᑦ, ᓂᕈᐊᕆᐊᖅᑐᕈᑎᐅᕗᖅ 88 ᐳᓴᓐᑎᓄᑦ ᓂᕈᐊᕈᓐᓇᕐᑐᓄᑦ. ᖃᐅᔨᒪᔭᐅᑦᑎᐊᕐᑐᖅ ᒎ ᐋᕐᓗᕐᑐ, ᓯᕗᓕᐅᕐᑎᒧᑦ ᑐᒡᓕᕆᔭᐅᓂᑯ ᓄᓇᑦᓯᐊᕐᒧᑦ, ᓵᓚᐅᓚᐅᕐᐳᖅ ᕿᑭᖅᑖᓘ ᓂᒋᐊᓄᑦ ᐊᒻᒪᓗ ᓄᓇᑦᓯᐊᕐᒥ ᒥᓂ’ᔅᑕᐅᓚᐅᕐᓯᒪᔪᖅ ᒪᓃᑦᑐᖅ ᑖᒻᓴᓐ ᐊᕐᓇᑐᐊᙳᓪᓗᓂ ᑲᑎᒪᔨᕐᔪᐊᙳᖃᑕᐅᕗᖅ. At a leadership session held less than one month before the birth of the new territory, MLAs-elect choose the rookie MLA for Iqaluit-West, Paul Okalik, 34, to serve as Nunavut’s first premier. They also pick the other members of Nunavut’s first cabinet: James Arvaluk, Jack Anawak, Manitok Thompson, Kelvin Ng, Ed Picco, Peter Kilabuk and Donald Havioyak. ᓯᕗᓕᐅᕐᑏ ᑲᑎᖃᑎᒌᒃᑎᓪᓗᒋ ᑕᕿᕐᒥ ᓯᕗᓂᐊᓂ ᓄᓇᕗᑦ ᐱᒋᐊᒻᒪᕆᓚᐅᕐᑎᓐᓇᒍ, ᒪᓕᒐᓕᐅᕐᑎᐅᓂᕐᒧᑦ ᓂᕈᐊᖅᑕᐅᓯᒪᔪᑦ ᓂᕈᐊᓚᐅᕐᓯᒪᔪᑦ ᒪᓕᒐᓕᐅᕐᑎᐅᓕᓵᕐᓯᒪᔪᒥᒃ ᐹᓪ ᐅᑲᓕᖅ, ᑕᐃᔅᓱᒪᓂ 34, ᓄᓇᕗᒥᑦ ᓯᕗᓕᐅᕐᑎᐅᓂᐊᕐᓗᓂ. ᓂᕈᐊᑲᑕᓚᐅᕐᒥᔪᑦ ᓄᓇᕗᒥᑦ ᒥᓂᔅᑕᐅᓂᐊᕐᑐᓂᒃ: ᔭᐃᒥᓯ ᐊᕐᕚᕐᓗᒃ, ᔮᒃ ᐊᓇᕈᐊᖅ, ᒪᓃᑦᑐᖅ ᑖᒻᓴᓐ, ᑭᐊᕕᓐ ᐃᖕ, ᐃᐊᑦ ᐲᑯ, ᐲᑕ ᕿᓚᐸᒃ ᐊᒻᒪ ᑖᓄᑦ ᕼᐊᕕᐅᔭᒃ. It’s an unforgettable day of music, dancing and celebration, broadcast live on national television and covered by news organizations from every corner of the planet. Because workers are still finishing construction of the legislative assembly building in Iqaluit, the first sitting of the Nunavut legislature is held inside the gym at Inuksuk High School. 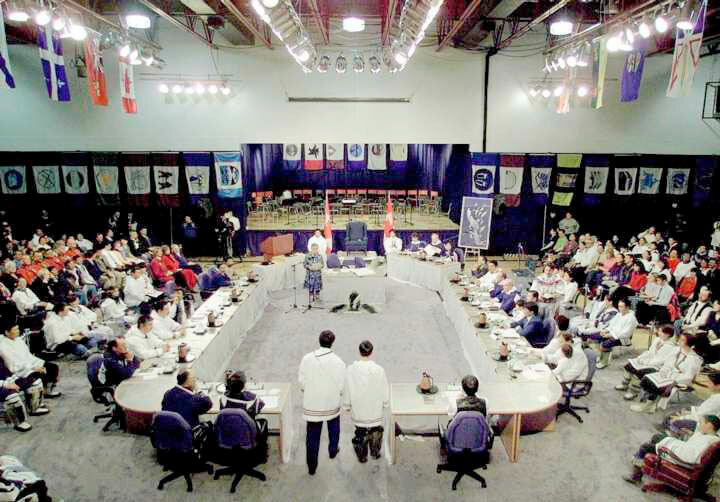 Nunavut Commissioner Helen Maksagak, Speaker Levi Barnabas, Prime Minister Jean Chrétien, Governor General Romeo LeBlanc and Northern Affairs Minister Jane Stewart all make speeches. ᐳᐃᒍᓇᙱᑦᑐᖅ ᐅᓪᓗᖅ ᑎᑕᑲᑕᒃᖢᑎᒃ, ᒧᒥᑲᑕᒃᖢᑎᒃ ᐊᒻᒪ ᖁᕕᐊᓲᑎᖃᖅᖢᑎᒃ, ᑕᓚᕖᓴᓐᑯᑦ ᓴᕿᔮᖅᑎᑕᐅᑲᐅᑎᒋᓪᓗᑎᒃ ᐊᒻᒪᓗ ᑐᓴᒐᒃᓯᓕᐅᕐᑎᓕᒫᓂᒃ ᐅᖃᐅᓯᐅᓪᓗᑎᒃ ᓄᓇᕐᔪᐊᓕᒫᒥᒃ. ᓴᓇᓂᖏᓐᓂᒃ ᓱᓕ ᒪᓕᒐᓕᐅᕐᕕᒃᓴᒥᑦ ᐃᖃᓗᖕᓂᑦ, ᓯᕗᓪᓕᖅᐹᑦ ᓄᓇᕗᑦ ᒪᓕᒐᓕᐅᕐᑏᑦ ᑲᑎᒪᓚᐅᕐᐳᑦ ᐃᓄᒃᓱᒃ ᐃᓕᓐᓂᐊᕐᕕᐊᓗᖕᒥᑦ. ᓄᓇᕗᒧᑦ ᑲᒥᓯᓇ ᕼᐊᓚᓐ ᒪᒃᓵᒐᒃ, ᐅᖃᖅᑎ ᓕᕙᐃ ᐹᓇᐸᔅ, ᑲᓇᑕᒧᑦ ᐊᖓᔪᖅᑳᖅ ᔮᓐ ᑯᕆᑦᑎᐊᓐ, ᒐᕙᓇ ᔭᓄᕈᓪ ᕉᒥᐅ ᓚᐸᓛᖕᒃ ᐊᒻᒪᓗ ᓄᓇᖃᖅᑳᖅᑐᓕᕆᓂᕐᒧᑦ ᒥᓂᔅᑕ ᔭᐃᓐ ᓯᐃᓐ ᓯᑑᐊᑦ ᑕᒪᕐᒥᒃ ᐅᖃᓪᓚᒃᖢᑎᒃ. Nunavut’s first big controversy erupts. The Government of Nunavut creates a single time zone, moving the Baffin and Kitikmeot regions into the same time zone as the Kivalliq. People in Kitikmeot and ­Kivalliq ­support the move, but many Baffin residents are bitterly opposed. A year later, the GN backs down and Nunavut moves back to three time zones. ᓄᓇᕗᒥ ᐊᖏᔪᕈᓗᖕᒥᑦ ᓈᒻᒪᒌᖃᑦᑕᐅᑎᙱᓐᓂᕐᒥᒃ ᓴᖅᑭᑦᑐᖃᓚᐅᕐᐳᖅ. ᓄᓇᕗᑦ ᒐᕙᒪᒃᑯᑦ ᖃᐅᔨᓴᐅᑎᐅᑉ ᐃᖏᕐᕋᕙᖕᓂᖓᓂ ᐊᑕᐅᓯᙳᖅᑎᑦᑎᓚᐅᕐᐳᑦ, ᕿᑭᖅᑖᓗᒃᒥᐅᑦ ᐊᒻᒪ ᕿᑎᕐᒥᐅᑦ ᖃᐅᔨᓴᐅᑎᖓᑦᑕ ᐃᖏᕐᕋᓂᖓ ᑭᕙᓪᓕᕐᒧᑦ ᒪᓕᒃᑎᑕᐅᓕᕐᖢᓂ. ᕿᑎᕐᒥᐅᑦ ᐊᒻᒪ ᑭᕙᓪᓕᕐᒥᐅᑦ ᑕᒪᑐᒥᖓ ᐃᑲᔪᕐᑐᐃᓪᓗᑎᒃ, ᑭᓯᐊᓂᓕ ᐊᒥᓱᑦ ᕿᑭᖅᑖᓗᖕᒥᐅᑦ ᐊᒃᓱᕈᓗᒃ ᓈᒻᒪᒃᓴᓚᐅᙱᑦᑐᑦ. ᐊᕐᕌᒍ ᐊᓂᒍᕐᑎᓪᓗᒍ, ᓄᓇᕗᑦ ᒐᕙᒪᒃᑯᑦ ᑕᒪᑐᒥᖓ ᓄᖃᖅᑎᑦᑎᓕᓚᐅᕐᐳᑦ ᐊᒻᒪ ᖃᐅᔨᓴᐅᑎᐅᑉ ᐊᐅᓚᓪᓂᕆᕙᒃᑕᖏᓐᓄᑦ ᑖᒃᑯᓇᓂ ᐅᑎᖅᖢᓂ ᐃᓕᖁᓯᕕᓂᖏᓐᓄᑦ. Iqaluit receives its official designation as a city. The city’s population grows from between 5,000 and 6,000 on July 1, 2001, to just over 8,000 in 2018. ᐃᖃᓗᐃᑦ ᓇᓗᓇᐃᕐᑕᐅᒻᒪᕆᒃᐳᑦ ᓄᓇᓕᐸᐅᔭᐅᓂᕐᒥᒃ. ᓄᓇᓕᐸᐅᔭᐃᑦ ᐃᓄᒋᐊᕐᓂᖓ ᐱᕈᕐᐹᓪᓕᓚᐅᕐᒪᑦ 5,000 ᐊᒻᒪ 6,000 ᐊᑯᓐᓂᖓᓂᒃ ᔪᓚᐃ 1, 2001-ᒥᑦ ᒪᐅᖓ 8,000 ᐅᖓᑎᑦᑎᐊᖓᓄᑦ 2018-ᒥᑦ. The stunning feature-length film, Atanarjuat, directed by Zacharias Kunuk of Igloolik, wins the Camera d’Or, or “golden camera,” award at the Cannes film festival. The film goes on to win many other honours and is now considered one of the best motion pictures ever made in Canada. ᑲᒪᓇᕈᓘᔭᕐᑐᖅ ᑕᕐᕆᔭᒐᓕᐊᒐᖅ, ᐊᑕᓈᕐᔪᐊᑦ, ᐊᐅᓚᑕᐅᓪᓗᓂ ᓴᖃᓕᐊᓯ ᑯᓄᒃᒧᑦ ᐃᒡᓗᓕᒃᒥᐅᑕᒥ ᓵᓚᒃᓴᐅᓯᐊᕐᐳᖅ Camera d’Or, ᐅᕝᕙᓘᓐᓃᑦ “ᒎᓗ ᐊᔾᔨᓕᐅᕈᑎᙳᐊᖅ,” ᐃᓕᓴᕆᔭᐅᔾᔪᑎᑖᕈᑎᒥᑦ ᐅᕙᓂ ᑳᓐᔅ ᐊᔾᔨᓕᐅᒐᓄᑦ ᖁᕕᐊᓱᖕᓇᒥᑦ. ᑕᕐᕆᔭᒐᓕᐊᒐᖅ ᐅᓄᕐᑐᓂᒃ ᐃᓕᓴᕆᔭᐅᔾᔪᑎᑖᓚᐅᕐᒥᔪᖅ ᐊᒻᒪ ᒫᓐᓇ ᐃᓱᒪᒋᔭᐅᓕᕐᖢᓂ ᐱᐅᓂᖅᐹᖑᖃᑕᐅᓂᖓᓂᒃ ᑕᕐᕆᔭᒐᓕᐊᓂᒃ ᓴᓇᔭᐅᓯᒪᔪᓂᒃ ᑲᓇᑕᒥ. Tanya Tagaq of Cambridge Bay joins the Icelandic singer, songwriter and recording artist Björk in Paris for the first concert of a tour that exposes Tagaq to a global audience and kickstarts her now-celebrated career. Tagaq’s first album, Sinaa, wins a Juno award in 2005. In 2016, she’s named a member of the Order of Canada and in 2018 her book Split Tooth is nominated for a Scotiabank Giller Prize. ᑖᓂᐊ ᑕᒑᖅ ᐃᖃᓗᒃᑑᑦᑎᐊᕐᒥᐅᑕᖅ ᐃᓚᐅᓕᕐᐳᖅ ᐊᐃᔅᓛᓐᒥᐅᑕᒥᒃ ᐃᙱᕐᑎᒥᑦ, ᐃᙱᐅᓯᐅᕐᑎ ᐊᒻᒪ ᓂᐱᓕᐅᕆᓯᒪᔪᖅ ᐱᐅᒃ (Bjork) ᐱᐅᕆᔅᒥᑦ ᓯᕗᓕᖅᐹᒥᑦ ᖁᙱᐊᖅᑕᐅᑲᑕᖕᓂᐊᖅᖢᓂ ᑕᒑᖅ ᖃᐅᔨᔭᐅᔾᔫᒥᓂᐊᕐᒪᑦ ᓄᓇᕐᔪᐊᒥᐅᓄᑦ ᐊᒻᒪ ᐱᒋᐊᕈᑎᒋᒻᒪᕆᒃᖢᓂᐅᒃ ᐃᙱᖅᑎᐅᓂᕐᒥᒃ. ᑕᒑᑉ ᓯᕗᓕᖅᐹᖅ ᓂᐱᓕᐅᕐᓂᑯᖓ, ᓯᓈ, ᓵᓚᒃᓴᐅᓯᐊᕐᐳᖅ ᔫᓄ ᐃᓕᓴᕆᔭᐅᔾᔪᑎᓂᒃ 2005-ᒥᑦ. 2016-ᒥᑦ ᑕᐃᔭᐅᒋᕗᖅ ᐃᓚᒋᔭᐅᓂᕐᒥᒃ ᐅᕘᓇ Order of Canada ᐊᒻᒪᓗ 2018-ᒥᑦ ᐅᖃᓕᒫᒐᓕᐊᖓ ‘ᓯᐱᓕᑦ ᑑᑦ’ (Split Tooth) ᓂᕈᐊᒐᒃᓴᙳᕐᑎᑕᐅᕗᖅ ᓯᑰᓯᐊᐹᖕᒃ ᒋᓗ ᓵᓚᒃᓴᐅᓯᐊᕐᒥᒃ (Scotiabank Giller Prize). Queen Elizabeth II, with her husband, Prince Philip, the Duke of Edinburgh, speaks Inuktitut during a visit to Nunavut, the newest territory in her realm. “Nakurmiit ammalu quviasugitsi,” (Thank you and congratulations) she declares at the end of a nationally televised dedication ceremony in Iqaluit for the Nunavut legislature. “Your land is indeed your strength,” the Queen says in English. ᑯᐃᓐ ᐃᓕᓴᐱ II, ᐅᐃᖓᓗ ᐳᕆᓐᔅ ᕕᓕᑉ, ᑑᒃ ᐊᕝ ᐊᑎᖕᐳᒡ, ᐅᖃᓪᓚᒃᐳᖅ ᐃᓄᒃᑎᑐᑦ ᐳᓛᕐᑎᓪᓗᒋᑦ ᓄᓇᕗᒧᑦ, ᓄᑖᖑᓛᖅ ᐃᒻᒥᒃᑰᖓᓕᕐᑐᖅ ᐊᕕᒃᑐᕐᓯᒪᓂᒃᑯᑦ ᓄᓇᖁᑎᖏᓐᓂᒃ, “ᓇᑯᕐᒦᑦ ᐊᒻᒪᓗ ᖁᕕᐊᓱᒋᑦᓯ,” ᐅᖃᖅᑐᖅ ᑲᓇᑕᒥ ᑕᓚᕖᓴᓕᕆᔨᓄᑦ ᓴᕿᔮᖅᑎᑕᐅᔪᖅ ᖁᕕᐊᓲᑎᖃᖅᑎᓪᓗᒋᑦ ᐃᖃᓗᖕᓄᑦ ᐅᑯᓂᖓ ᓄᓇᕗᒥᑦ ᒪᓕᒐᓕᕆᔨᒃᓴᓂᒃ. “ᓄᓇᓯ ᓴᙱᓂᕆᓪᓚᕆᒃᑕᓯ,” ᑯᐃᓐ ᐅᖃᖅᑐᖅ ᖃᓪᓗᓈᑎᑐᑦ. By a razor-thin margin of 10 votes to eight, Nunavut MLAs pass their first big piece of new legislation: the Human Rights Act. MLAs, and much of Nunavut, were divided over the contentious issue of including sexual orientation as grounds for discrimination. The act passes only after a passionate five-hour debate. ᖃᓂᒌᒃᑐᓪᓛᓘᓪᓗᑎᒃ 10 ᓂᕈᐊᖅᖢᑎᒃ 8 ᐊᖏᙱᖢᑎᒃ, ᓄᓇᕗᒥᑦ ᒪᓕᒐᓕᐅᕐᑎᑦ ᐊᓂᒍᐃᑎᑦᑎᕗᑦ ᓯᕗᓪᓕᖅᐹᒥᑦ ᐊᖏᔪᒥᒃ ᐱᖁᔭᕐᔪᐊᕆᓂᐊᖅᑕᖓᓂᒃ: ᓄᓇᕗᒻᒥ ᑭᒃᑯᑐᐃᓐᓇᐃᑦ ᐱᔪᓐᓇᐅᑎᖏᓐᓄᑦ ᐱᖁᔭᕐᔪᐊᖅ. ᒪᓕᒐᓕᐅᕐᑎᐅᔪᑦ ᐊᒻᒪ ᓄᓇᕗᒥᐅᑕᐃᓐᓇᐸᓗᐃᑦ ᐊᕕᒃᓯᒪᓚᐅᕐᒪᑕ ᐆᒧᖓ ᐊᕐᓇᐅᓂᕐᒧᑦ/ᐊᖑᑎᐅᓂᕐᒧᑦ ᖃᓄᐃᓕᖓᓂᖅ ᐊᔾᔨᒌᙱᔾᔪᑎᐅᓂᕐᒨᓇᔭᕆᐊᒃᓴᖓᓂᒃ. ᐱᖁᔭᕐᔪᐊᖅ ᐊᓂᒍᓚᐅᕐᑐᖅ ᐃᑲᕐᕋᓂᒃ ᑕᓪᓕᒪᓂᒃ ᐅᖃᐅᓯᐅᑲᑕᒻᒪᕆᓚᐅᕐᖢᓂ. Nunavut MLAs pass their next big piece of legislation: a new Wildlife Act. 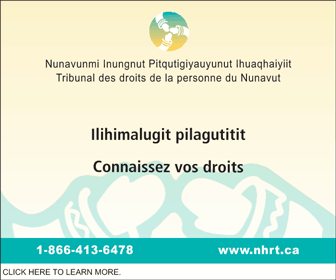 The new law contains an Inuit Qaujimajatuqangit section that acknowledges traditional Inuit culture and values, and a statement of values and principles. ᓄᓇᕗᒥᑦ ᒪᓕᒐᓕᐅᕐᑎᐅᔪᑦ ᐊᓂᒍᐃᑎᑦᑎᕗᑦ ᑭᖑᓪᓕᖓᓂᒃ ᐱᖁᔭᕐᔪᐊᖑᓂᐊᕐᑐᒥᒃ: ᓄᑖᖅ ᐆᒪᔪᓕᕆᓂᕐᒧᑦ ᐱᖁᔭᕐᔪᐊᖅ. ᑖᓐᓇ ᓄᑖᖅ ᒪᓕᒐᖅ ᐃᓗᓕᖃᖅᑐᖅ ᐃᓄᐃᑦ ᖃᐅᔨᒪᔭᑐᖃᖏᓐᓂᒃ ᓇᓗᓇᐃᕐᓯᓯᒪᓪᓗᓂ ᐃᓄᐃᑦ ᐃᓕᖁᓯᖏᓐᓂᒃ ᐊᒻᒪ ᐱᒻᒪᕆᐅᒋᔭᖏᓐᓂᒃ, ᐊᒻᒪᓗ ᐅᖃᐅᓯᕐᒥ ᐱᒻᒪᕆᖕᓂᒃ ᐊᒻᒪ ᐱᓪᓚᕆᒋᔭᐅᔪᓂᒃ. For Nunavut’s second election, the first to be conducted by Elections Nunavut, 82 people contest 19 seats. The vote produces an initial turnout rate of 98.1 per cent—an inflated number created by many eligible voters not being registered. ᓄᓇᕗᑦ ᑭᖑᓪᓕᐊᓂᒃ ᓂᕈᐊᕐᓇᒥᑦ, ᓯᕗᓪᓕᕐᓕ ᐊᐅᓚᑕᐅᓂᑯ ᓂᕈᐊᖅᑐᓕᕆᔨᓄᑦ ᓄᓇᕗᒥ, 82 ᐃᓄᐃᑦ ᓂᕈᐊᒐᒃᓴᐅᓚᐅᕐᓯᒪᔪᑦ 19-ᓄᑦ ᐃᒃᓯᕙᐅᑕᒃᓴᓄᑦ. ᓂᕈᐊᕐᓂᖅ ᓂᕈᐊᕈᓐᓇᖅᑐᓂᒃ 98.1-ᓂᒃ ᓂᕈᐊᕐᕕᐅᓚᐅᕐᑐᖅ-ᓇᐃᓴᐅᑎ ᐅᓄᕐᓯᑎᑕᐅᓯᒪᔪᖅ ᐊᒥᓱᓄᑦ ᓂᕈᐊᕈᓐᓇᖅᑐᓂᒃ ᐊᑎᓕᐅᖅᑕᐅᓯᒪᙱᑦᑐᕕᓂᕐᓄᑦ. Prime Minister Stephen Harper and Nunavut Premier Paul Okalik attend the opening of the Tahera Corp.’s Jericho diamond mine. But by the end of 2008, the business had gone into bankruptcy protection. Later attempts to revive the operation also fizzled. ᑲᓇᑕᐅ ᐊᖓᔪᖅᑳᖓ ᓯᑏᕙᓐ ᕼᐋᐳ ᐊᒻᒪ ᓄᓇᕗᑦ ᓯᕗᓕᐅᕐᑎᖓ ᐹᓪ ᐅᑲᓕᖅ ᐅᐸᒍᑎᕗᑦ ᒪᑐᐃᖅᑕᐅᓂᖓᓂ ᐅᓇ ᑕᕼᐃᐅᕋ ᑯᐊᐳᕇᓴᓐᑯᑦ ᔨᐅᕆᑰ ᑕᐃᒪᓐ ᐅᔭᕋᒃᓂᐊᕐᕕᒃᒥᑦ. ᑭᓯᐊᓂᓕ 2008 ᐃᓱᓕᓕᕐᑎᓪᓗᒍ, ᑖᒃᑯᐊ ᓇᖕᒥᓂᖅ ᐱᓕᕆᐊᖃᖅᑐᑦ ᑮᓇᐅᔭᖃᙱᓗᐊᕐᓂᕐᒧᑦ ᓴᐳᔾᔭᐅᓯᒪᔭᕆᐊᖃᓕᓚᐅᕐᐳᑦ. ᑭᖑᓂᐊᒍᑦ ᑖᔅᓱᒪ ᐊᐅᓚᑕᐅᓇᓱᖕᓂᖓ ᐊᒻᒪ ᓄᖅᑲᑐᐃᓐᓇᓚᐅᕆᕗᖅ. Nunavut Tunngavik Inc. files a lawsuit against the Government of Canada, seeking $1 billion in damages for failing to implement the Nunavut land claims agreement. The most important issues are an allegation that Ottawa has failed to implement Article 23 on Inuit employment and an allegation that Ottawa handcuffed the arbitration board set up to resolve implementation disputes. ᓄᓇᕗᑦ ᑐᙵᕕᒃᑯᑦ ᑎᒥᖓ ᐃᖃᖅᑐᐃᕕᒃᑯᑦ ᐸᓯᔭᒃᓴᙳᖅᑎᑦᑎᕗᑦ ᑲᓇᑕᐅᑉ ᒐᕙᒪᖓᓂᒃ, ᐱᓇᓱᒃᖢᑎᒃ $1 ᐱᓕᐊᓐ ᑖᓚᓂᒃ ᓱᕋᐃᓂᕐᒧᑦ ᐊᑐᓕᖅᑎᑦᑎᓯᒪᙱᓐᓂᖏᓐᓂᒃ ᓄᓇᕗᑦᒥ ᓄᓇᑖᕐᓂᕐᒧᑦ ᐊᖏᕈᑎᓂᒃ. ᐱᒻᒪᕆᐅᓛᖑᓚᐅᕐᑐᖅ ᐃᓱᒫᓘᑎᒋᔭᐅᔪᓂ ᐅᓇ ᐸᓯᔭᒃᓴᐅᑎᑦᑎᓂᖅ ᐋᑐᕚᒥ ᐊᑐᓕᖅᑎᑦᑎᓯᒪᙱᓐᓂᖏᑦ ᐋᑎᑯᓪ 23-ᒥ ᐃᓄᖕᓂᒃ ᐃᖅᑲᓇᐃᔭᖅᑎᑦᑎᔭᕆᐊᖃᕐᓂᕐᒥᒃ ᐊᒻᒪᓗ ᐋᑐᕚᒥ ᓄᖃᖓᑎᑦᑎᓚᕆᖕᓂᖏᓐᓂᒃ ᐋᔩᖃᑎᒌᑦ ᑲᑎᒪᔨᖏᓐᓂᒃ ᐋᕿᒃᑕᐅᓯᒪᔪᓂᒃ ᐊᑐᓕᖅᑎᑦᑎᓂᕐᒧᑦ ᓈᒻᒪᙱᓕᐅᕈᑎᐅᔪᓂᒃ. Nunavut MLAs pass a revamped Official Languages Act, but it must await “concurrence” from Parliament. It finally receives parliamentary concurrence on June 11, 2009, and replaces the Official Languages Act inherited from the Northwest Territories. ᓄᓇᕗᒥᑦ ᒪᓕᒐᓕᐅᕐᑎᑦ ᐊᓂᒍᐃᑎᑦᑎᕗᑦ ᐋᕿᒋᐊᒃᑲᓐᓂᕐᓯᒪᔪᒥᒃ ᐅᖃᐅᓯᓪᓚᕆᖕᓄᑦ ᐱᖁᔭᖅᔪᐊᕐᒥᑦ, ᑭᓯᐊᓂᓕ ᐅᑕᖅᑭᔭᕆᐊᖃᖅᑐᑦ “ᐊᖏᖃᑎᖃᕐᓂᕐᒥᑦ” ᒪᓕᒐᓕᕆᕕᒡᔪᐊᒥᑦ ᐋᑐᕚᒥᑦ. ᐊᖏᖃᑎᖃᕈᑎᐅᑕᐃᓐᓇᖅᐳᖅ ᔫᓂ 11, 2009-ᒥᑦ ᐊᒻᒪ ᐃᓚᖏᕐᓯᒍᑎᐅᓪᓗᓂ ᐅᖃᓯᓪᓚᕇᑦ ᐱᖁᔭᖅᔪᐊᒥᑦ ᐊᑐᖅᑕᐅᓕᕐᓂᑯᓂᒃ ᓄᓇᑦᓯᐊᕐᒥᑦ. Nunavut MLAs pass the Inuit Language Protection Act, which establishes a right to education in the Inuit language and requires that businesses and organizations offer services in the Inuit language. Also, on Sept. 18, MLAs, after hearing much criticism of the bill from Nunavut Tunngavik Inc. and other Inuit organizations, pass a new Education Act, replacing a law inherited from the Northwest Territories. The new education law was intended to create a fully bilingual school system, from kindergarten to Grade 12, by 2019–20. ᓄᓇᕗᑦ ᒪᓕᒐᓕᐅᕐᑎᖏᑦ ᐊᓂᒍᐃᑎᑦᑎᕗᑦ ᐃᓄᐃᑦ ᐅᖃᐅᓯᖏᓐᓂᒃ ᓴᐳᔾᔨᓯᒪᓂᕐᒧᑦ ᒪᓕᒐᕐᔪᐊᖅᒥ, ᐱᕕᖃᕈᓐᓇᕐᓯᑎᑦᑎᓯᒪᓪᓗᓂ ᐃᓕᓐᓂᐊᖅᑎᑦᑎᔪᓐᓇᕐᓂᕐᒥᒃ ᐃᓄᐃᑦ ᐅᖃᐅᓯᖓᒍᑦ ᐊᒻᒪᓗ ᐱᖁᔨᓯᒪᔪᒥᑦ ᓇᖕᒥᓂᕆᔭᐅᔪᑦ ᐊᒻᒪ ᑲᑐᔾᔨᖃᑎᒌᖑᔪᑦ ᐱᔨᑦᑎᕋᐅᑎᖃᕐᓗᑎᒃ ᐃᓄᐃᑦ ᐅᖃᐅᓯᖓᒍᑦ. ᐊᒻᒪᓗ, ᓯᑎᐱᕆ 18-ᒥᑦ, ᒪᓕᒐᓕᐅᕐᑎᐅᔪᑦ, ᑐᓵᕋᓪᓚᓚᐅᕐᖢᑎᒃ ᓈᒻᒪᙱᓕᐅᕈᑎᓂᒃ ᒪᓕᒐᒃᓴᐅᑉ ᒥᒃᓵᓄᑦ ᓄᓇᕗᑦ ᑐᙵᕕᒃᑯᓐᓂᑦ ᐊᒻᒪ ᐊᓯᖏᓐᓂᒃ ᐃᓄᐃᑦ ᑲᑐᔾᔨᖃᑎᒌᖏᓐᓂᒃ, ᐊᓂᒍᐃᑎᑦᑎᓕᓚᐅᕐᐳᑦ ᓄᑖᒥᑦ ᐃᓕᓐᓂᐊᕐᓂᓕᕆᓂᕐᒧᑦ ᐱᖁᔭᕐᔪᐊᖅᒥᑦ, ᐃᓇᖏᕐᓯᓯᒪᓪᓗᓂ ᐱᖁᔭᕐᔪᐊᕐᒥᑦ ᓄᓇᑦᓯᐊᕐᒥᑦ ᐊᑐᓕᕐᓂᑯᓂᒃ. ᓄᑖᖅ ᐃᓕᓐᓂᐊᕐᓂᓕᕆᓂᕐᒧᑦ ᐱᖁᔭᕐᔪᐊᖅ ᐋᕿᒃᑕᐅᓯᒪᓇᓱᓚᐅᕐᑐᖅ ᐋᕿᒃᓯᓂᐊᕐᓗᑎᒃ ᐅᖃᐅᓯᕐᓂᒃ ᐊᑐᖅᑕᐅᕙᒃᑐᓂᒃ ᐃᓕᓐᓂᐊᕈᑎᒃᓴᖃᕐᓗᑎᒃ, ᐃᓕᓐᓂᐊᓕᓵᕐᓂᖏᓐᓂᒃ ᒍᕇᑦ 12-ᒧᑦ, ᑎᑭᒐᓱᖕᓂᖓᓂᒃ 2019-20-ᒥᑦ. In Nunavut’s third territorial election, 46 candidates are nominated to contest 19 seats. Two of them, Keith Peterson of Cambridge Bay and Tagak Curley of Rankin Inlet North, win by acclamation. After the votes are counted, 10 rookie MLAs win seats. ᓄᓇᕗᒥᑦ ᐱᖓᔪᒋᔭᐅᔪᖅ ᐊᕕᒃᑐᖅᓯᒪᓂᒃᑯᑦ ᓂᕈᐊᒐᒃᓴᓕᕆᓂᕐᒥᒃ, 46 ᓂᕈᐊᒐᒃᓴᐅᓚᐅᕐᐳᑦ 19-ᓄᑦ ᐃᒃᓯᕙᐅᑕᒃᓴᓄᑦ. ᒪᕐᕉᒃ ᑖᒃᑯᓇᙵᑦ, ᑮᑦ ᐲᑐᓴᓐ ᐃᖃᓗᒃᑑᑦᑎᐊᕐᒥᐅᑕᖅ ᐊᒻᒪ ᑕᒑᖅ ᑰᓕ ᑲᖏᖅᖠᓂᖅ ᐅᐊᖕᓇᒧᑦ, ᓵᓚᒃᓴᖅᐴᒃ ᐃᓕᔭᐅᑐᐃᓐᓇᕐᓂᒃᑯᑦ. ᓂᕈᐊᕈᑏᑦ ᓇᐃᓴᖅᑕᐅᓚᐅᕐᑎᓪᓗᒋᑦ, ᖁᓕᑦ ᓄᑖᑦ ᒪᓕᒐᓕᐅᖅᑎᙳᕐᐳᑦ. Nunavut’s newly elected MLAs reject two-time premier Paul Okalik and veteran politician Tagak Curley in favour of Iqaluit East MLA Eva Aariak, the respected former teacher and Nunavut languages commissioner. “Positive change will be the name of the game,” Aariak said. In her pitch, she promised an end to the “climate of intimidation” that took hold when Okalik was premier. “We should be able to approach our leaders with confidence that we will be listened to in a respectful way,” she said. ᓄᓇᕗᒥᑦ ᓄᑖᑦ ᒪᓕᒐᓕᐅᕐᑎᙳᖅᑐᑦ ᒪᕐᕈᐃᕐᓯᒪᓕᖅᑐᒥᒃ ᓯᕗᓕᐅᕐᑎᕕᓂᕐᒥᒃ ᐹᓪ ᐅᑲᓕᕐᒥᒃ ᐊᒻᒪ ᒪᓕᒐᓕᕆᔨᐅᑯᑖᓕᕐᑐᒥᑦ ᑕᒑᖅ ᑰᓕᒥ ᓂᕈᐊᙱᓚᑦ ᐅᓇ ᓂᕈᐊᖅᑕᐅᓪᓗᓂ ᐃᖃᓗᐃᑦ ᑲᓇᖕᓇᖓᓄᑦ ᒪᓕᒐᓕᐅᕐᑎᒥᒃ ᐄᕙ ᐋᕆᐊᒃ, ᖃᐅᔨᒪᔭᐅᑦᑎᐊᖅᑐᖅ ᐃᓕᓴᐃᔨᕕᓂᖅ ᐊᒻᒪ ᓄᓇᕗᒥᑦ ᐅᖃᐅᓯᕐᓄᑦ ᑲᒥᓯᓇᐅᓂᑰᓪᓗᓂ. “ᐱᒻᒪᕆᖕᓂᒃ ᐊᓯᙳᖅᑐᖃᕐᓂᐊᓕᕐᑐᖅ ᐱᓕᕆᓂᒃᑯᑦ,” ᐋᕆᐊᒃ ᐅᖃᖅᑐᖅ. ᐱᓇᓱᓕᕐᑎᓪᓗᒍ, ᐅᖃᓚᐅᕐᓯᒪᔪᖅ ᓄᖃᖅᑎᑦᑎᓂᐊᕐᓂᕋᖅᖢᓂ “ᐅᓗᕆᐊᕐᓵᕆᓂᒃᑰᖓᔪᓂᒃ” ᐊᑐᖅᑕᐅᓕᓚᐅᕐᓯᒪᔪᓂᒃ ᐅᑲᓕᖅ ᓯᕗᓕᐅᕐᑎᐅᑎᓪᓗᒍ. “ᐅᐸᒍᓐᓇᕆᐊᖃᕋᑦᑎᒍᑦ ᓯᕗᓕᐅᕐᑎᕗᑦ ᐊᒻᒪ ᑐᓵᔪᓐᓇᑉᓗᑭᕐ ᐃᓱᒪᒋᔭᖃᑦᑎᐊᕐᓂᒃᑯᑦ,” ᐅᖃᖅᑐᖅ. Agnico Eagle Mines Ltd. pours the first gold bar produced by its Meadowbank mine near Baker Lake. This leads to a multi-generational set of developments in the Kivalliq region, which grow to include the Meliadine mine near Rankin Inlet and the Amaruq satellite deposit near Meadowbank. ᐊᒡᓂᑯ ᐄᒍᓪ ᐅᔭᕋᒃᓂᐊᕐᕕᒃ ᓕᒥᑦ ᑯᕕᓯᕗᑦ ᓯᕗᓪᓕᖅᐹᒥᑦ ᒎᓗᒥ ᒪᑐᐹᖕᒃ ᐅᔭᕋᒃᓂᐊᕐᕕᒃᒥᙶᖅᑐᒥᑦ ᖃᒪᓂᑦᑐᐊᑉ ᖃᓂᒋᔭᖓᓂᒃ ᑖᓐᓇᓕ ᐊᔾᔨᒌᙱᑦᑑᑎᓂ ᓴᓇᒍᑎᐅᓕᓚᐅᕐᐳᖅ ᐊᓯᖏᓐᓂᒃ ᑭᕙᓪᓕᕐᒥᑦ, ᐃᓚᖃᓕᒻᖢᓂ ᒥᓕᐊᑏᓐ ᐅᔭᕋᒃᓂᐊᕐᕕᒃ ᑲᖏᖅᖠᓂᐅᑉ ᖃᓂᒋᔭᖓᓂ ᐊᒻᒪ ᐊᒪᕈᖅ ᓇᓂᓯᕝᕕᐅᓯᒪᒋᓪᓗᓂ ᒪᑐᐹᖕᒃ ᖃᓂᒋᔭᖓᓂᒃ. Nunavut MLAs vote to approve a new electoral map, expanding the size of the legislature from 19 to 22 seats. ᓄᓇᕗᑦ ᒪᓕᒐᓕᐅᕐᑎᖏᑦ ᓂᕈᐊᖅᐳᑦ ᓄᑖᒥᒃ ᓂᕈᐊᕈᓐᓇᖅᑐᓕᕆᓂᕐᒧᑦ ᓄᓇᙳᐊᒥᑦ, ᐊᖏᒡᓕᒋᐊᖅᑕᐅᓪᓗᓂ ᒪᓕᒐᓕᕆᕝᕕᒃ ᐊᖏᒡᓕᒋᐊᖅᑕᐅᓪᓗᓂ 19-ᓂ ᐃᒃᓯᕙᐅᑕᓂᒃ 22-ᓄᑦ. Following heated public forums held in 2011, Premier Eva Aariak’s government releases the Government of Nunavut’s first uranium policy. It says the GN supports uranium mining, subject to five conditions. ᐱᐊᓂᒃᑎᓪᓗᒋ ᑭᒃᑯᓕᒫᓂᒃ ᑲᑎᒪᑎᑦᑎᓂᕐᒥᒃ ᑭᐅᓘᑎᕈᓘᔭᕐᓇᒥᒃ 2011-ᖑᑎᓪᓗᒍ, ᓯᕗᓕᐅᕐᑎ ᐄᕙ ᐋᕆᐊᑉ ᒐᕙᒪᖓ ᑐᓴᖅᑎᑦᑎᓕᓚᐅᕐᐳᑦ ᓄᓇᕗᑦ ᒐᕙᒪᒃᑯᑦ ᓯᕗᓪᓕᖅᐹᖓᓂᒃ ᔪᕇᓂᐊᒻᒧᑦ ᐊᑐᐊᒐᓂᒃ. ᐅᖃᕐᓯᒪᔪᖅ ᓄᓇᕗᑦ ᒐᕙᒪᒃᑯᑦ ᐃᑲᔪᖅᑐᐃᓂᖏᓐᓂᒃ ᓄᓇᕗᑦ ᒐᕙᒪᒃᑯᓐᓂᑦ ᔪᕇᓂᐊᒻᒧᑦ ᐅᔭᕋᒃᓂᐊᕐᓂᕐᒥᒃ, ᒪᓕᒃᓯᒪᔭᕆᐊᖃᖅᖢᑎᒃ ᑕᓪᓕᒪᓂᒃ. The first election for Nunavut’s newly expanded 22-seat legislature attracts 73 candidates. Kugluktuk candidate Peter Taptuna and Netsilik candidate Jeannie Ugyuk win by acclamation. Five incumbents—Johnny Ningeongan, Eva Aariak, Hezakiah Oshutapik, Ron Elliot and Fred Schell—lose their seats in a vote that attracts a turnout of about 70 per cent. ᓯᕗᓪᓕᖅᐹᖅ ᓄᓇᕗᒥᑦ ᐅᓄᕐᓯᒋᐊᖅᑕᐅᓯᒪᔪᑦ 22 ᐃᒃᓯᕙᐅᑕᐃᑦ ᓂᕈᐊᒐᒃᓴᐅᕝᕕᐅᕗᑦ 73-ᓄᑦ. ᖁᒡᓗᖅᑑᒥ ᓂᕈᐊᒐᒃᓴᖅ ᐲᑕ ᑕᑉᑑᓇ ᐊᒻᒪ ᓇᑦᓯᓕᒃᒧᑦ ᓂᕈᐊᒐᒃᓴᖅ ᔩᓂ ᐅᒡᔪᒃ ᐃᓕᔭᐅᑐᐃᓐᓇᖅᐳᑦ. ᑕᓪᓕᒪᑦ ᓂᕈᐊᖅᑕᐅᒃᑲᓐᓂᕋᓱᒃᑐᑦ—ᔮᓂ ᓂᖏᐅᖓᓐ, ᐄᕙ ᐋᕆᐊᒃ, ᐃᔨᑭᐊ ᐅᓱᒃᑖᐱᒃ, ᐅᕌᓐ ᐃᓕᐊᑦ ᐊᒻᒪ ᕗᕆᐊᑦ ᓯᓂᐅᓪ—ᓂᕈᐊᖅᑕᐅᓚᐅᙱᑦᑐᑦ ᓂᕈᐊᕆᐊᖅᑐᖅᑎᓪᓗᒋᑦ 70-ᐳᓴᓐᑎᖏᑦ ᓂᕈᐊᕈᓐᓇᖅᑐᓂᒃ. Kugluktuk MLA Peter Taptuna, who had served as economic development minister in the previous government, becomes the first Nunavut premier from outside the Baffin region. MLA choose Taptuna over Paul Okalik and Paul Quassa. ᖁᒡᓗᖅᑑᕐᒧᑦ ᒪᓕᒐᓕᐅᕐᑎ ᐲᑕ ᑕᑉᑑᓇ, ᐱᕙᓪᓕᐊᔪᓕᕆᓂᕐᒧᑦ ᒥᓂᔅᑕᐅᓚᐅᕐᑐᖅ ᓯᕗᓂᖏᓐᓂᒃ ᒐᕙᒪᐅᓚᐅᕐᑐᓂᒃ, ᓯᕗᓪᓕᖅᐹᖑᕗᖅ ᕿᑭᖅᑖᓘᑉ ᓯᓚᑖᓂᑦ ᓯᕗᓕᐅᕐᑎᙳᖅᑐᓂᒃ. ᒪᓕᒐᓕᐅᕐᑏᑦ ᓂᕈᐊᓚᐅᕐᒪᑕ ᑕᑉᑑᓇᒥ ᐅᑯᐊ ᓂᕈᐊᒐᒃᓴᐅᖃᑕᐅᓪᓗᑎᒃ ᐹᓪ ᐅᑲᓕᖅ ᐊᒻᒪ ᐹᓪ ᖁᐊᓴ. The auditor general of Canada, Michael Ferguson, releases a highly unflattering report on the GN’s attempt to implement the 2008 Education Act. He finds the territorial government has no hope of meeting its bilingual education goal by 2019–20. ᑮᓇᐅᔭᓂᒃ ᖃᐅᔨᓴᖅᑎᑦ ᐊᖓᔪᖅᑳᖓᑦ ᑲᓇᑕᒥ, ᒪᐃᑯᓪ ᕘᒍᓴ, ᑐᓴᖅᑎᑦᑎᕗᖅ ᑐᓴᕐᓂᓗᐊᙱᑦᑐᓂᒃ ᐅᓂᒃᑳᓂᒃ ᓄᓇᕗᑦ ᒐᕙᒪᒃᑯᑦ ᐋᕿᒃᓱᕋᓱᒃᓯᒪᒐᓱᒃᑕᖓᓂᒃ 2008 ᐃᓕᓐᓂᐊᕐᓂᓕᕆᓂᕐᒧᑦ ᐱᖁᔭᕐᔪᐊᓂᒃ. ᖃᐅᔨᕗᖅ ᓄᓇᕗᑦ ᒐᕙᒪᒃᑯᑦ ᑎᑭᐅᑎᔪᓐᓇᔾᔮᙱᓐᓂᖏᓐᓂᒃ ᒪᕐᕈᐃᓂᒃ ᐅᖃᐅᓯᖃᕐᓂᒃᑯᑦ ᐃᓕᓐᓂᐊᕐᓂᓕᕆᓂᖅ ᐅᓇ ᑎᑭᓚᐅᕐᑎᓐᓇᒍ 2019/2020. The federal government and Nunavut Tunngavik Inc. sign a settlement agreement that resolves the lawsuit that NTI filed in December 2006. Ottawa agrees to pay NTI $255 million. Of that, NTI keeps $80.5 million for itself and puts the other $174.5 million into a pot of money that eventually falls under the Makigiaqta Inuit Training Corp.
ᒐᕙᒪᑐᖃᒃᑯᑦ ᐊᒻᒪ ᓄᓇᕗᑦ ᑐᙵᕕᒃᑯᑦ ᐊᑐᓕᐅᓚᐅᕐᒪᑕ ᐊᖏᖃᑎᒌᒍᑎᒥ ᐋᕿᒋᐊᕈᑎᒥᑦ ᐃᖃᖅᑐᐃᕕᒃᑯᑦ ᐱᓕᕆᔾᔪᑎᐅᓇᓱᒃᑐᒥᑦ ᓄᓇᕗᑦ ᑐᙵᕕᒃᑯᓐᓄᑦ ᑎᓯᐱᕆ 2006-ᖑᑎᓪᓗᒍ. ᐋᑐᕚ ᐊᖏᖅᑐᖅ ᐊᑭᓖᓂᐊᕐᓗᑎᒃ ᓄᓇᕗᑦ ᑐᙵᕕᒃᑯᓐᓂᑦ $255 ᒥᓕᐊᓐ ᑖᓚᓂᒃ. ᑕᕝᕙᙵᑦ, ᓄᓇᕗᑦ ᑐᙵᕕᒃᑯᑦ ᐱᓯᒪᓗᑎᒃ $80.5 ᒥᓕᐊᓐ ᑖᓚᓂᒃ ᐊᒻᒪ ᐊᒥᐊᒃᑯᖓ $174.5 ᒥᓕᐊᓐ ᑖᓚᐃᑦ ᓴᓂᕐᕙᒃᑕᐅᓯᒪᓗᑎᒃ ᐅᕘᓈᓕᕐᓂᐊᕐᓗᓂ ᒪᑭᒋᐊᖅᑕ ᐃᓄᐃᑦ ᐃᓕᓐᓂᐊᕐᓂᓕᕆᓂᕐᒧᑦ ᑲᑐᔾᔨᖃᑎᒌᓄᑦ. A special discretionary coroner’s inquest into Nunavut’s elevated rates of death by suicide gets underway in Iqaluit. The six-person jury learns that the Government of Nunavut’s suicide prevention strategy was never funded. The jury makes about 30 recommendations and urges the GN to declare that suicide is a public emergency. ᐸᓗᖕᓂᑦ ᐃᓱᒪᓕᐅᕆᕗᑦ ᐊᒻᒪ ᑎᓕᐅᕆᓪᓗᑎᒃ ᓄᓇᕗᑦ ᒐᕙᒪᒃᑯᓐᓂᑦ ᓇᓗᓇᐃᖁᔨᓪᓗᑎᒃ ᐃᒻᒥᓃᑲᑕᖕᓂᖅ ᑭᒃᑯᓕᒫᓄᑦ ᑐᐊᕕᕐᓇᖅᑑᓂᖓᓂᒃ. The Embrace Life Council announces a funded suicide prevention action plan, following revelations at a coroner’s inquest that revealed the GN had not agreed to fund its suicide prevention strategy. ᐃᓵᒃᓯᒪᒋᑦ ᐃᓅᓯᕐᒥ ᑲᑎᔾᔨᖃᑎᒌᑦ ᑐᓴᖅᑎᑦᑎᕗᑦ ᐃᑲᔫᑎᑖᕈᑎᐅᔪᓐᓇᖅᑐᒥᒃ ᐃᒻᒥᓃᖅᑎᑦᑎᑦᑕᐃᓕᓂᕐᒧᑦ ᖃᓄᐃᓕᐅᕈᑎᒃᓴᓄᑦ, ᑐᖁᖓᔪᓕᕆᔨ ᖃᐅᓗᔨᓴᕐᓂᖓ ᓴᕿᑎᑦᑎᓚᐅᕐᑎᓪᓗᒋᑦ ᓄᓇᕗᑦ ᒐᕙᒪᒃᑯᑦ ᐊᖏᓚᐅᙱᓐᓂᖏᓐᓂᒃ ᐃᒻᒥᓃᖅᑎᑦᑎᑦᑕᐃᓕᓂᕐᒧᑦ ᖃᓄᐃᓕᐅᕈᑎᒃᓴᓄᑦ. Eleven regular MLAs refuse to move the GN’s Education Act amendments into committee of the whole for third reading. This means that the task of updating Nunavut’s failed 2008 Education Act will fall to the next legislative assembly. 11 ᒪᓕᒐᓕᐅᕐᑎᑐᐃᓐᓇᐃᑦ ᐊᖏᙱᓚᑦ ᓄᓇᕗᑦ ᒐᕙᒪᒃᑯᑦ ᐃᓕᓐᓂᐊᕐᓂᓕᕆᓂᕐᒧᑦ ᐱᖁᔭᕐᔪᐊᖓᓄᑦ ᐋᕿᒋᐊᕈᑎᒃᓴᑦ ᑲᑎᒪᔨᕋᓛᓄᐊᕐᑕᐅᔪᒪᑎᓪᓗᒋᑦ ᐱᖓᔪᖓᓐᓂᒃ ᐅᖃᓕᒫᕐᑕᐅᓂᐊᖅᑎᓪᓗᒍ. ᑐᑭᖃᖅᑐᖅ ᐊᓂᒍᕐᓂᙱᑦᑐᖅ 2008 ᐃᓕᓐᓂᐊᕐᓂᓕᕆᓂᕐᒧᑦ ᐱᖁᔭᕐᔪᐊᑦ ᑭᖑᓪᓕᕐᓄᑦ ᒪᓕᒐᓕᕆᔨᓄᑦ ᑲᒪᒋᔭᐅᓂᐊᕐᓂᖏᓐᓂᒃ. MLAs also refuse to debate Bill 40, an act to amend Nunavut’s Corrections Act that would clarify inmate rights and other issues. That task will also fall to the next legislature. ᒪᓕᒐᓕᐅᕐᑏᑦ ᐊᒻᒪ ᐊᖏᙱᒃᑭᕗᑦ ᐅᖃᐅᓯᖃᖃᑎᒌᒍᑎᖃᕐᓂᕐᒥᒃ ᐱᖁᔭᖅ 40-ᒥᑦ, ᐱᖁᔭᕐᔪᐊᖅ ᐋᕿᒋᐊᖅᑎᑦᑎᒍᑎ ᓄᓇᕗᒥᑦ ᐱᕋᔭᓕᕆᓂᕐᒧᑦ ᐱᖁᔭᕐᔪᐊᖅᒥᑦ ᓇᓗᓇᐃᔭᐃᓇᔭᖅᑐᒥᑦ ᑎᒍᔭᐅᓯᒪᔪᑦ ᐱᔪᓐᓇᐅᑎᖏᓐᓂᒃ ᐊᒻᒪ ᐊᓯᖏᓐᓂᒃ ᐃᓱᒫᓘᑎᓂᒃ. ᑖᓐᓇᑦᑕᐅᖅ ᐱᓕᕆᐊᖑᓂᐊᕐᒥᔪᖅ ᑭᖑᓪᓕᕐᓂᒃ ᒪᓕᒐᓕᐅᖅᑎᒃᓴᓂᒃ. For Nunavut’s fifth territorial election, 72 candidates emerge, one of whom is Mila Kamingoak of Kugluktuk, who wins by acclamation. Turnout ranges from 48 per cent to 81 per cent, depending on the community. Eight incumbents—Alex Sammurtok, Tom Sammurtok, George Kuksuk, Paul Okalik, Monica Ell-Kanayuk, Johnny Mike, Isaac Shooyook and George Qulaut—are defeated, and six women become MLAs. ᓄᓇᕗᑦ ᑕᓪᓕᒪᒋᓕᖅᑕᖓᓂᒃ ᓂᕈᐊᕕᓕᒡᔪᐊᕐᓇᒥᑦ, 72 ᓂᕈᐊᒐᒃᓴᐅᓚᐅᕐᐳᑦ, ᐃᓚᖓᑦ ᒦᓚ ᑲᒥᖑᐊᒃ ᖁᒡᓗᖅᑑᒥᐅᑕᖅ ᓵᓚᒃᓴᐅᓯᐊᖅᖢᓂ ᐃᓂᑖᑐᐃᓐᓇᖅᖢᓂ. ᓂᕈᐊᕈᓐᓇᖅᑐᑦ ᒫᓃᓚᐅᕐᑐᑦ 48 ᐳᓴᓐᑎᖏᓐᓂᒃ 81 ᐳᓴᓐᑎᓄᑦ, ᒪᓕᒃᖢᑎᒃ ᓄᓇᓕᐅᔪᓂᒃ. 8 ᓂᕈᐊᒐᒃᓴᐅᒃᑲᓐᓂᖅᑐᑦ—ᐋᓕᒃᔅ ᓴᒻᒧᕐᑐᖅ, ᑖᒻ ᓴᒻᒧᕐᑐᖅ, ᔪᐊᔾ ᑯᒃᓱᒃ,ᐸᓪ ᐅᑲᓕᖅ, ᒫᓂᑲ ᐃᐅᓪ-ᑲᓇᔪᖅ, ᔮᓂ ᒪᐃᒃ, ᐊᐃᓴᒃ ᓲᔪᒃ ᐊᒻᒪ ᔪᐊᔾ ᖁᓚᐅᑦ—ᓵᓚᐅᕗᑦ ᐊᒻᒪ 6-ᓂᒃ ᐊᕐᓇᓂᒃ ᒪᓕᒐᓕᐅᖅᑎᑖᖅᖢᑎᒃ. MLAs choose Aggu MLA Paul Quassa to serve as premier, selecting him over Rankin Inlet North–Chesterfield Inlet’s Cathy Towtongie, Aivilik’s Patterk Netser and Arviat South’s Joe Savikataaq. ᒪᓕᒐᓕᐅᕐᑎᐅᔪᑦ ᓂᕈᐊᓚᐅᕐᑐᑦ ᐊᒡᒍᒧᑦ ᒪᓕᒐᓕᐅᕐᑎᒥᑦ ᐹᓪ ᖁᐊᓴ ᓯᕗᓕᐅᕐᑎᐅᓂᐊᕐᓗᓂ, ᓂᕈᐊᕆᔭᐅᓪᓗᓂ ᐅᑯᐊᑦᑕᐅᖅ ᓂᕈᐊᒐᒃᓴᐅᒐᓗᐊᕐᑎᓪᓗᒋᑦ ᑲᖏᖅᖠᓂᐅᑉ ᐅᐊᖕᓇᖓᓄᑦ-ᐃᒡᓗᓕᒑᕐᔪᒃᒧᑦ ᑳᑎ ᑕᐅᑐᙱ, ᐊᐃᕕᓕᒃᒧᑦ ᐸᑎᕐ ᓇᑦᓱ ᐊᒻᒪ ᐊᕐᕕᐊᑦ ᓂᒋᐊᓄᑦ ᔫ ᓴᕕᑲᑖᖅ. Paul Quassa’s short stint as Nunavut premier comes to an abrupt halt, when 16 MLAs vote to remove him and only three vote to keep him in office, with one member abstaining. Their reasons include Quassa’s “autocratic style” and allegations of misleading statements. Quassa stays on as MLA for Aggu. ᐹᓪ ᖁᐊᓴᐅᑉ ᓇᐃᑦᑐᖅ ᓄᓇᕗᒧᑦ ᓯᕗᓕᐅᕐᑎᐅᓂᖓ ᓄᖃᑳᓪᓚᒃᐳᖅ, ᐅᑯᖓ 16 ᒪᓕᒐᓕᐅᖅᑏᑦ ᓂᕈᐊᕐᑎᓪᓗᒋ ᐲᖅᑕᐅᖁᔭᐅᑎᓪᓗᒍ ᐊᒻᒪ ᐱᖓᓱᑦ ᓂᕈᐊᖅᖢᑎᒃ ᐃᓂᖓᓃᖁᔨᓪᓗᑎᒃ, ᐊᑕᐅᓯᕐᓕ ᓂᕈᐊᙱᖢᓂ. ᐱᔾᔪᑎᒋᓚᐅᕐᑕᖓᓕ ᐃᓚᖃᖅᑐᖅ ᖁᐊᓴᐅᑉ “ᐊᖓᔪᖅᑳᖑᔾᔪᓯᖓᓂᒃ” ᐊᒻᒪ ᓱᓕᖏᑦᑐᓂᒃ ᐅᖃᐅᓯᖃᕐᓂᕐᒧᑦ. ᖁᐊᓴ ᒪᓕᒐᓕᐅᖅᑎᐅᖏᓐᓇᖅᑐᖅ ᐊᒡᒍᒧᑦ. After dumping Paul Quassa from the premier’s position, MLAs turn to Arviat South MLA Joe Savikataaq, electing him over Aivilik MLA Patterk Netser and Rankin Inlet South MLA Lorne Kusugak. To fill the vacant spot in cabinet left by Quassa’s departure, they choose Iqaluit–Tasiluk MLA George Hickes. ᐊᓂᑕᐅᓚᐅᕐᑎᓪᓗᒍ ᐹᓪ ᖁᐊᓴ ᓯᕗᓕᐅᕐᑎᐅᓂᕐᒥᒃ, ᒪᓕᒐᓕᐅᕐᑏᑦ ᓵᖔᓕᓚᐅᕐᐳᑦ ᐊᕐᕕᐊᑦ ᓂᒋᐊᓄᑦ ᒪᓕᒐᓕᐅᖅᑎᒥᒃ ᔫ ᓴᕕᑲᑖᕐᒥᒃ, ᓂᕈᐊᕆᔭᐅᓪᓗᓂ ᐅᑯᐊ ᓂᕈᐊᒐᒃᓴᐅᖃᑕᐅᒐᓗᐊᖅᖢᑎᒃ ᐊᐃᕕᓕᒃᒧᑦ ᒪᓕᒐᓕᐅᕐᑎ ᐸᑎᖅ ᓇᑦᓱ, ᐊᒻᒪ ᑲᖏᖅᖠᓂᐅᑉ ᓂᒋᐊᓄᑦ ᒪᓕᒐᓕᐅᕐᑎ ᖁᐊᓴ ᑯᓱᒐᖅ. ᒥᓂᔅᑕᐅᓂᕐᒧᑦ ᐃᓂᒋᓚᐅᕐᑕᖓᓄᑦ ᖁᐊᓴᐅᑉ, ᓂᕈᐊᓚᐅᕐᑐᑦ ᐃᖃᓗᐃᑦ-ᑕᓯᕐᓗᒃᒧᑦ ᒪᓕᒐᓕᐅᕐᑎ ᔪᐊᔾ ᕼᐃᒃᔅᒥᑦ. Nunavut Premier Joe Savikataaq removes all of Pat Angnakak’s cabinet portfolios one day after she reads aloud from a confidential cabinet document, in response to a question from an MLA about staff housing. Angnakak quits cabinet the next day, but not before she blasts Savikataaq for a “severe” and “heavy-handed” decision. ᓄᓇᕗᑦ ᓯᕗᓕᐅᕐᑎᖓ ᔫ ᓴᕕᑲᑖᖅ ᐲᔭᐃᕗᖅ ᐹᑦ ᐊᕐᓇᒃᑲᐅᑉ ᒥᓂᔅᑕᐅᓂᕐᒧᑦ ᑲᒪᒋᔭᖏᓐᓂᒃ ᐅᓪᓗᖅ ᐊᓂᒍᖅᑎᓪᓗᒍ ᐅᖃᓕᒫᕌᓪᓚᓚᐅᖅᑎᓪᓗᒍ ᑕᒪᐅᖓᒥᐊᖅᑕᐅᔭᕆᐊᖃᙱᑦᑐᒥᒃ, ᐊᐱᕆᔭᐅᓚᐅᕐᑎᓪᓗᒍ ᒪᓕᒐᓕᐅᕐᑎᒥᒃ ᐃᖅᑲᓇᐃᔭᖅᑏᑦ ᐃᒡᓗᒋᕙᒃᑕᖏᓐᓂᒃ. ᐊᕐᓇᒃᑲᒃ ᖃᐅᒃᐸᙳᖅᑎᓪᓗᒍ ᓄᖃᓕᓚᐅᖅᑕᖓ ᒥᓂᔅᑕᐅᓂᖓ, ᐅᖃᓚᐅᖅᖢᓂ “ᐊᒃᓱᓗᐊᕋᓗᒃ” ᐊᒻᒪ “ᐊᒃᓱᕈᓗᐊᖅᖢᓂ” ᐃᓱᒪᓕᐅᕆᓚᐅᕐᓂᕋᑲᖅᖢᓂᐅᒃ ᓴᕕᑲᑖᖅ. Nunavut MLAs choose Aivilik MLA Patterk Netser to ­fill the cabinet vacancy left by the departure of Pat Angnakak. ᓄᓇᕗᑦ ᒪᓕᒐᓕᐅᖅᑎᑦ ᓂᕈᐊᖅᐳᑦ ᐊᐃᕕᓕᒃᒧᑦ ᒪᓕᒐᓕᐅᕐᑎᒥᒃ ᐸᑎᖅ ᓇᑦᓱᒥᑦ ᐃᓇᖐᓂᐊᖅᖢᓂ ᒥᓂᔅᑕᐅᕕᒋᓂᑯᖓ ᐹᑦ ᐊᕐᓇᒃᑲᒃ ᓄᖃᖅᑎᓪᓗᒍ. No addition of the most recent Leg were they tossed out the Inuktitut Language requirement in Education by 2019 so that it is no longer a legal priority. Jim please bring this up to April 1, 2019. Lots of focus on political struggle, but not much on practical, in-the-snow change. What has been the change in life expectancy during the past 20 years? What has been the change in the suicide rate? What has been the change in people’s health? What has been the change in smoking? What has been the change in the housing stock? What has been the change in homelessness? What has been the change in high school graduation rates? What has been the change in university graduation rates? What has been the change in average income? What has been the change in poverty? What has been the change in Inuit food self-sufficiency? What has been the change in hunger? 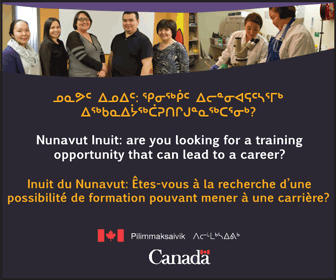 What has been the change in Inuit employment? 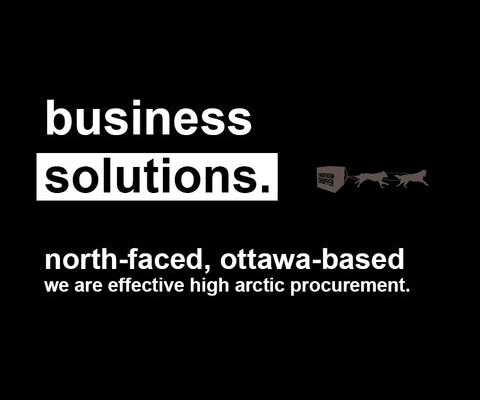 What has been the change in Inuit business ownership? What has been the change in Inuit migration out of Nunavut? What has been the change in incarceration rates? What has been the change in domestic violence rates? What has been the change in number of registered vehicles in Nunavut? What has been the change in number of snow machines? What has been the change in the number of scientific papers published annually by Inuit researchers? Why are these improvements not “front and center”?